President Donald Trump sought to set the record straight on the contours of his trade truce with Xi Jinping of China on Tuesday after his advisers repeatedly mangled his message – and sent the stock market into a massive sell-off as a result. 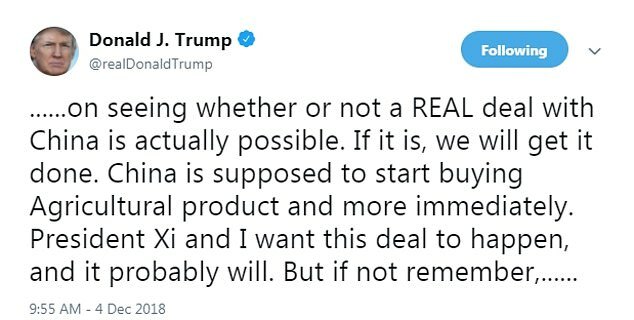 Trump said in tweets that he and Xi would ‘probably’ have a deal at the end of a 90-day timetable for talks that began on Saturday. 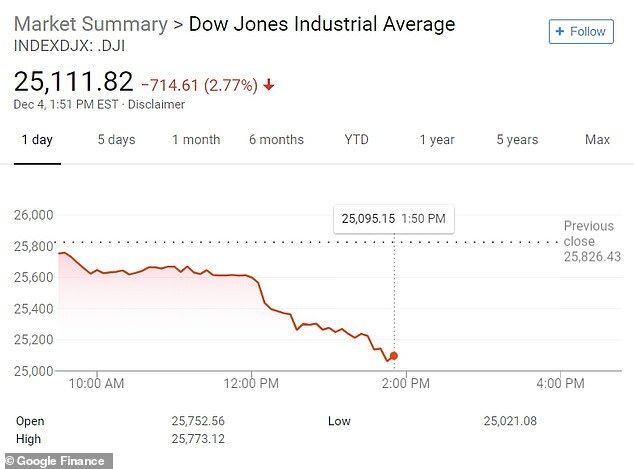 Trump’s tweets sent the market plunging. The Dow fell throughout the morning and was down by more than 700 points by early afternoon. The president’s top economic adviser indicated on Monday that the trade truce with China would be called off if an accord doesn’t begin to ‘firm up’ in the next three months as he insisted that Trump would prefer a deal to tariffs. ‘At the end of 90 days, they have to show significant progress,’ Larry Kudlow told reporters. ‘He wants a world with zero tariffs, zero non-tariff barriers and zero subsidies…That’s his goal,’ the president’s National Economic Council director said. The 90-day timetable started Saturday and will stave off a round of tariffs on Beijing that were scheduled to go into effect on Jan. 1, the White House said on Monday afternoon after Kudlow mistakenly claimed Trump would hold off on further action until April. It’s by March 1 that the White House has set as the deadline for the Chinese to act. ‘At the end of 90 days, they have to show significant process,’ Larry Kudlow, director of the National Economic Council, reaffirmed. ‘This is not going to be something where there is soft commitments that get kicked down the road,’ Treasury Secretary Steve Mnuchin said. Talks with China have fallen apart at other junctures, including a round of talks led by Mnuchin earlier this year. 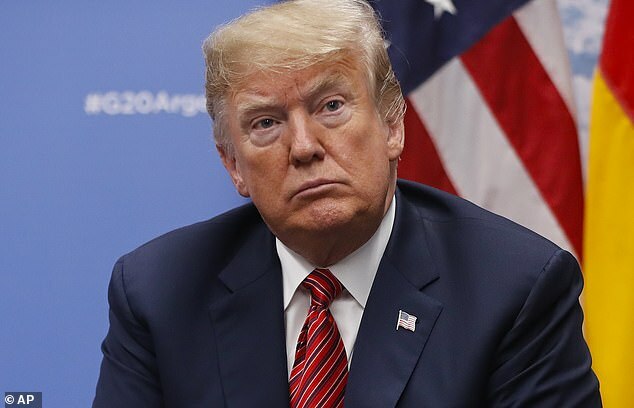 Trump imposed $200 billion in tariffs on China as a result that he pledged to raise to $500 billion at the beginning of next year unless there’s a deal. Negotiations on the U.S. side are being led by Robert Lighthizer, the president’s trade representative, Kudlow said, offering a conflicting account from Mnunchin, who’d claimed earlier in the day that Trump is in charge of talks. 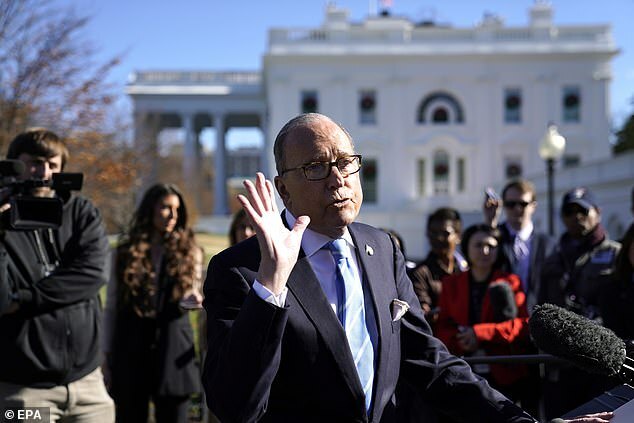 ‘Nothing will happen without President Trump,’ Kudlow explained as he spoke to reporters on the White House’s front lawn. The White House says it is cautiously optimistic after a dinner between Presidents Trump and Xi over the weekend that a deal would come out of the new push. 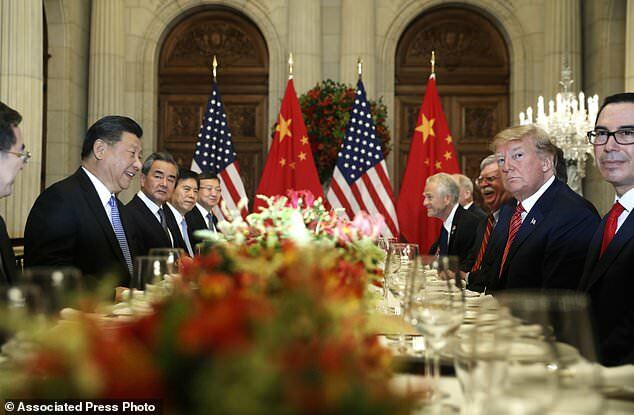 President Trump also said Monday that U.S.-China relations ‘have taken a BIG leap forward’ after he and President Xi Jinping agreed on the trade truce. Trump used the name of a Communist Party of China farm reform program that killed tens of millions of people 60 years ago. 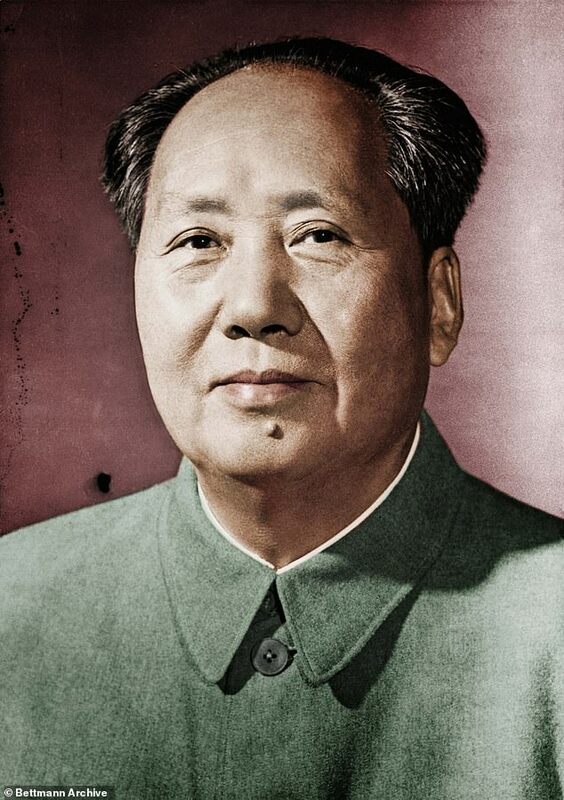 The Great Leap Forward was a cornerstone of Chairman Mao Zedong’s move toward a socialist economy by requiring farmers to ‘collectivize’ their property and operations, and by forcing farm workers to take industrial jobs. 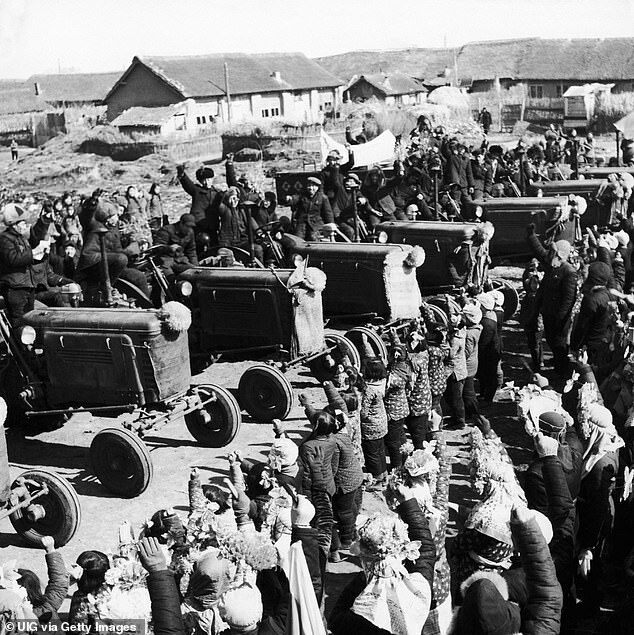 Upsetting centuries of agrarian tradition and moving farmers to factory work led to a famine that killed tens of millions of Chinese. Government officials tried to reverse the trend by instituting farm production quotas, executing some who failed to meet minimum targets. China’s economy was devastated. ‘We are dealing from great strength, but China likewise has much to gain if and when a deal is completed. Level the field!’ he wrote. 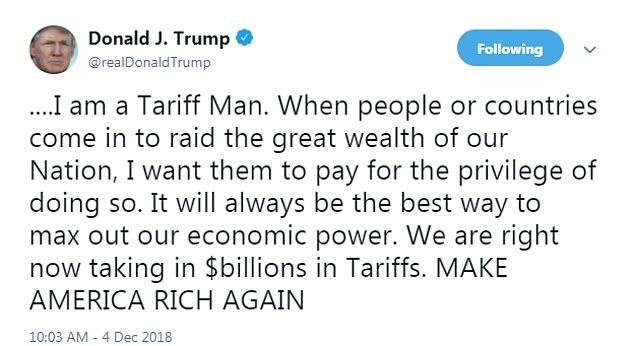 Minutes later, the president specifically tied his self-congratulation to what he predicted will be a dramatic increase in farm exports from the U.S. to China. ‘Farmers will be a a very BIG and FAST beneficiary of our deal with China. They intend to start purchasing agricultural product immediately. We make the finest and cleanest product in the World, and that is what China wants. Farmers, I LOVE YOU!’ he tweeted. 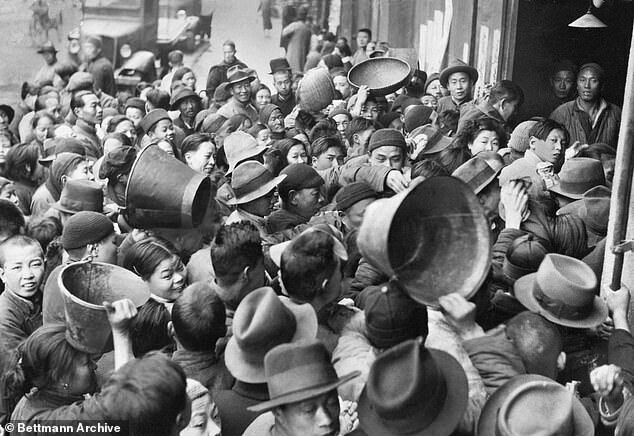 historians’ estimates of the number of Chinese killed by the famine that resulted from the Great leap Forward range from 18 million to 55 million. 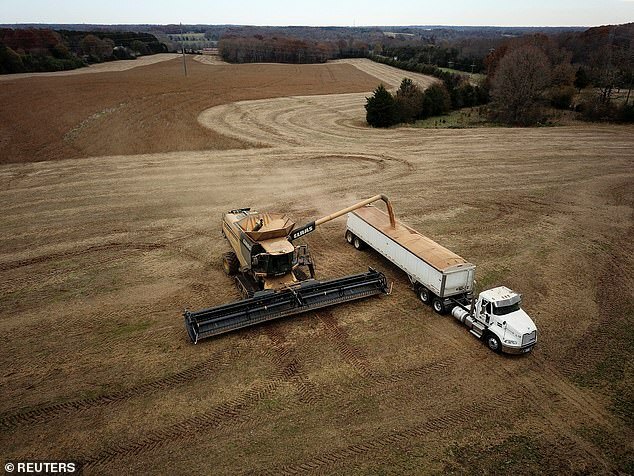 Buyers and analysts quickly pointed out on Monday that China’s tariffs on U.S. farm produce are still in place, mostly 25 per cent duties on soybeans, corn, sorghum and wheat. 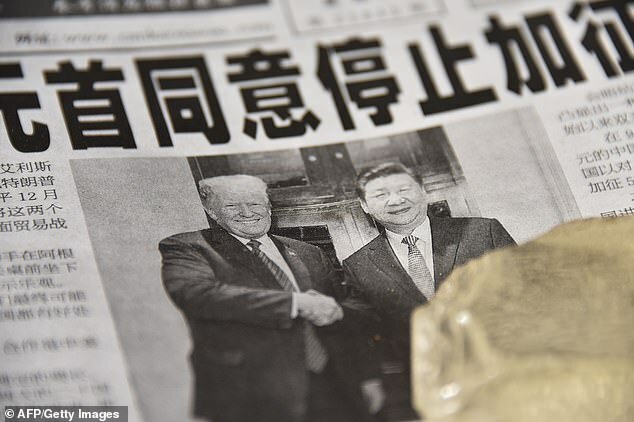 The ‘deal’ appeared on Monday to be little more than a cease-fire in what had become a protracted tariff war, with Trump and Xi agreeing pull back from an all-out trade war that was threatening world economic growth and had set global investors on edge. This year Trump imposed an import tax of 25 percent on $50 billion in Chinese products, then hit an additional $200 billion worth of goods with 10 percent tariffs. Those 10 percent tariffs were scheduled to ratchet up to 25 percent on Jan. 1 if the U.S. and China failed to reach an agreement to at least postpone that move. In Buenos Aires, Trump agreed to delay the scheduled U.S. tariff increase for 90 days while the two sides negotiate over the administration’s complaints related to how Beijing systematically steals trade secrets and forces the U.S. and other foreign countries to hand over sensitive technology as the price of admission to the vast Chinese market. In return, China agreed to buy what the White House called a ‘not yet agreed upon, but very substantial’ amount of U.S. products to help narrow America’s gaping trade deficit with China. If the Chinese did eventually increase such purchases, it would be warmly welcomed in the U.S. Farm Belt, where producers of soybeans and other crops have been hurt by Beijing’s retaliatory tariffs. Trump tweeted late Sunday that ‘China has agreed to reduce and remove tariffs on cars coming into China from the U.S. Currently the tariff is 40%.’ There was no Chinese announcement about possible tariff cuts, and the Ministry of Commerce in Beijing didn’t immediately respond to questions. Kudlow says that Xi indicated that ‘large numbers of transactions’ of agricultural, energy and industrial commodities would be accompanied by tariff reductions soon. He put a ballpark estimate at $1.2 billion, although he noted they are private sector transactions.